Neer Dose/ Thellevu / Bari akki Dose is one of the common breakfast items in North Canara and South Canara region of Karnataka. It is very easy to make and does not require any fermentation. I prefer non-stick pan, as it is easier and can avoid most of the disasters :). Give it a shot. Let me know how it turned out. Happy cooking. Preparation time: 3 hrs for soaking, 30 min for grinding and preparing Dose. Soak the rice in water for 3-4 hours..
Then grind soaked Rice and grated Coconut into smooth paste using some water. Then add salt to taste and about 5 cups of water.The batter should be very watery. It should not stick to the ladle. Heat a non-stick pan. Take a ladleful of batter and spread on the pan. (I literally throw the batter on the pan from about 1/2 feet height). 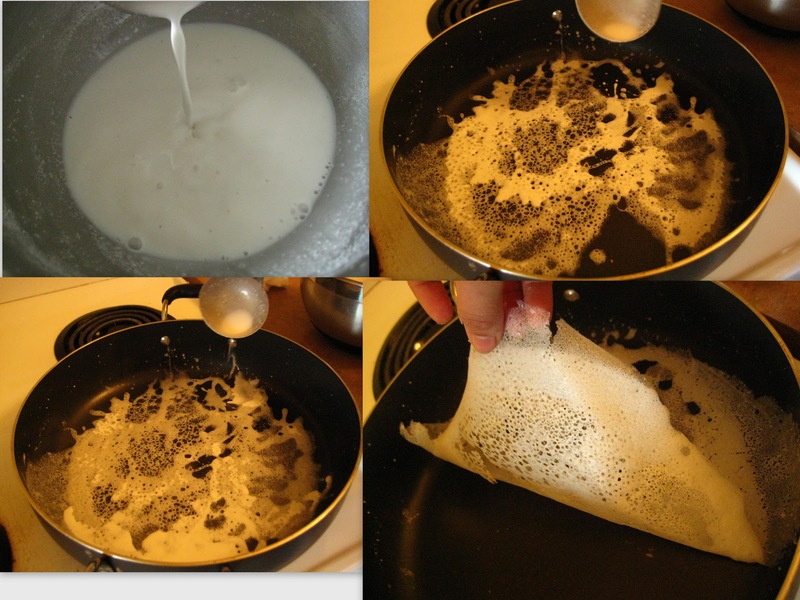 You will need about 2 ladleful of batter to make one dosa. Cover and cook for 2 min on a low to medium heat. Cook only one side. Serve hot with Chutney and Ghee. Wow looks so nice and yummy! 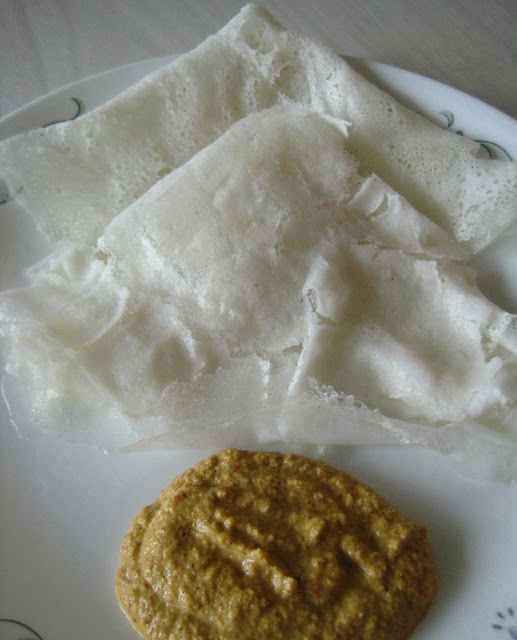 I love neer dosa, looks so perfect! 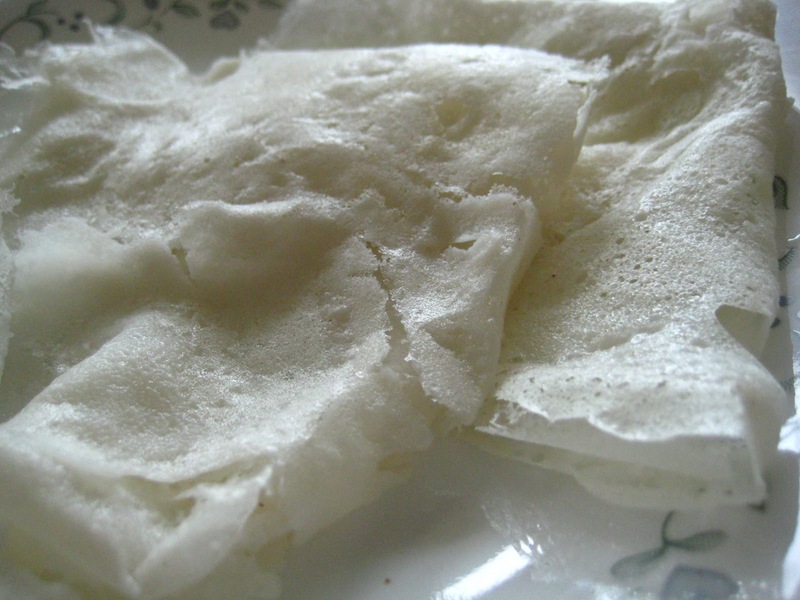 i love neer dosa a lot...looks soft n thin!!! very delicious dosas, soft n thin ones...happily following u..do drop at my space too..